Published: Oct. 29, 2017 at 01:16 p.m.
New Orleans Saints wide receiver Brandon Coleman sprints down the sideline and stumbles into the red zone on a 54-yard pass from quarterback Drew Brees. Published: Oct. 22, 2017 at 03:01 p.m.
New Orleans Saints quarterback Drew Brees finds the open wide receiver Brandon Coleman for a 22-yard TD. 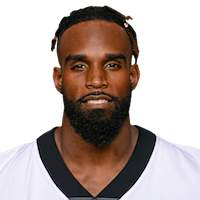 Published: Sept. 24, 2017 at 02:24 p.m.
New Orleans Saints wide receiver Brandon Coleman catches short pass from quarterback Drew Brees for a 5-yard touchdown completion. Published: Sept. 17, 2017 at 04:24 p.m.
New Orleans Saints QB Drew Brees hits wide receiver Brandon Coleman for a 25-yard catch.